Grilling Rib Eye Roast, How To Grill For Maximum Tenderness. 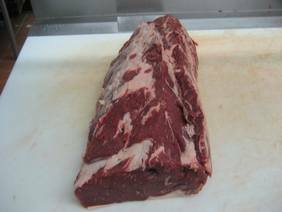 The rib eye roast comes from the rib section consisting of ribs 6 through 12, it is basically a prime rib roast with the bones removed. Depending on where you live this roast in some locations is simply called boneless rib roast. The rib is a naturally tender, rich flavored cut that is enjoyed by beef lovers worldwide. 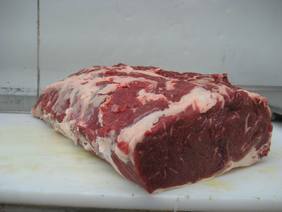 The rib eye roast is a superb tasting roast and the secret to acquiring a tender but moist ribeye recipe is to sear the roast first at a high temperature and then move it to indirect heat. This will give the rib eye a nice outer crust and seal in the juices. If tenderness and mouth watering flavor is what you’re craving, grilling rib eye to medium-rare is recommended or at the very most grilling to medium doneness, anything more will dry out the meat. Also if you like a little smoky flavor added to your beef than adding wood chunks or wood chips is easy to do on the grill for ribeye recipes. Click Here To Cook a Rib Eye Roast Indoors. 1. About 60 minutes before grilling rib eye remove from the refrigerator, bringing it to room temperature. This next step is optional, to add a smoky flavor soak 2 cups of wood chips covered in cold water about 15 minutes, drain and place in a metal wood chip box which can be found where most grills are sold. You can also use rectangular disposable foil tray for the wood chips or make your own out of aluminum foil. Take a piece of aluminum foil 15-20 inches long, fold both longs sides up about 1 inch and repeat on both short ends creating a tray to hold the wood chips. 2. Place tray with wood chips on the grill and turn on all burners to high. Close lid and preheat 15-20 minutes until the wood chips are heavily smoking. If not using wood chips preheat grill for 15 minutes on high. 3. Meanwhile rub the roast with vegetable oil, season with salt and pepper to taste or you can sprinkle on your favorite dry rub. One hour before grilling just rub the roast with vegetable oil and lightly rub the dry rub mixture onto the roast. 4. Scrape the grill clean with a wire brush, sear the roast on high 2½-3 minutes per side on all sides. 5. Leave the main burner on high and turn off all other burners. Place the rib eye over the cool part of the grill fat side up, cook for 1 hour with lid down, then turn the roast over. As the temperature drops try to keep the temperature about 300 degrees, adjust the heated burner as necessary. Grill the roast approximately 15 minutes per pound but it really depends on the internal temperature of the grill and the size of the roast. Continuing grilling until an instant-read thermometer registers 125-130 degrees for medium-rare which should be another 30-60 minutes. You should always use an instant-read thermometer to check the doneness of a roast. Always remove the roast 10 degrees before the desired temperature, the roast will rise another 10 degrees well resting. When grilling rib eye turn the roast work quickly to close cover and retain as much heat as possible in the grill. 6. Transfer roast to cutting board and tent loosely with tinfoil 20-30 minutes to allow juices to redistribute evenly throughout the roast. Cut crossways across the roast and serve. If any of your guest like their roast cooked well done, simply cut off a piece about ¾” and grill another 2 minutes per side over the hot part of the grill. 1. About 60 minutes before cooking the rib eye remove from the refrigerator to bring it to room temperature. This next step is optional, to add a smoky flavor soak wood chunks covered in cold water for 1 hour and drain or soak wood chips 15 minutes in cold water and drain, place in an aluminum or tinfoil container. Cover container tightly with foil and use a fork to make about 5-6 holes to allow the smoke to escape. 2. Meanwhile, light a fire with charcoal briquettes and allow to burn until covered with a thin layer of gray ash. Move coals to one side of the grill, piling 2-3 briquettes high. Open bottom vents completely and if using wood chunks or wood chips place wood chunks or the containers with wood chips on top of the charcoal and set cooking grate in place . 3. Open grill lid vents completely and cover, turning the lid so that the vents are opposite the wood chunks or chips to draw smoke through the grill. Let the grill heat for 5 minutes and clean with a wire brush. 4. Rub the roast with vegetable oil, season with salt and pepper to taste or you can sprinkle on your favorite dry rub. One hour before grilling just rub the roast with vegetable oil and lightly rub the dry rub mixture onto the roast. 5. Scrape the grill clean with a wire brush, sear the roast on high 2½-3 minutes per side for each side. 6. Place the rib eye over the cool part of the grill fat side up, cook for 1 hour with lid down, then turn the roast over. Grill the roast approximately 15 minutes per pound but it really depends on the internal temperature of the grill and the size of the roast. Continuing grilling until an instant-read thermometer registers 125-130 degrees for medium-rare which should be another 30-60 minutes. 7. Transfer roast to cutting board and tent loosely with tinfoil 20-30 minutes to allow juices to redistribute evenly throughout the roast. The internal temperature will rise about 10 degrees during resting time. Remove the prime rib 10 degrees before the desired doneness. Remember when grilling rib eye you should always use an instant-read thermometer to check the doneness of a roast. Insert thermometer into thickest part of roast in 2 different spots.